A good .22 pistol is the type of gun that everyone needs. They are handy, fun, good for plinking, pest control, and cheap to feed. There's been a decent .22 pistol around for as long as I remember. Back (way back) when I was five years old, the family .22 pistol was a High Standard HD. It was, and is, a fine little .22, and was particularly good in its time. Much later on, I decided to buy a small pail full of .22 pistols, an informal comparison for my own purposes. The winner back then, beating out the Browning Buckmark and several other models, for my purposes anyway, was a blued, Ruger 5-1/2 inch Bull Barrel target. It is a pistol I still use today. That pistol is more or less available currently as the 35.6 oz. Mark IV that has a MSRP of $529 in blued, $689 in the 42.8 oz. stainless version. My quibbles with the Mark II are few: a little bit of excessive take-up with the trigger, and of course the infamous difficulty in cleaning, now addressed in the Ruger Mark IV. The SW Victory has a small amount of take-up, and a trigger that breaks crisply at about 3-3/4 lbs. The features and specs listed by S&W are as follows. 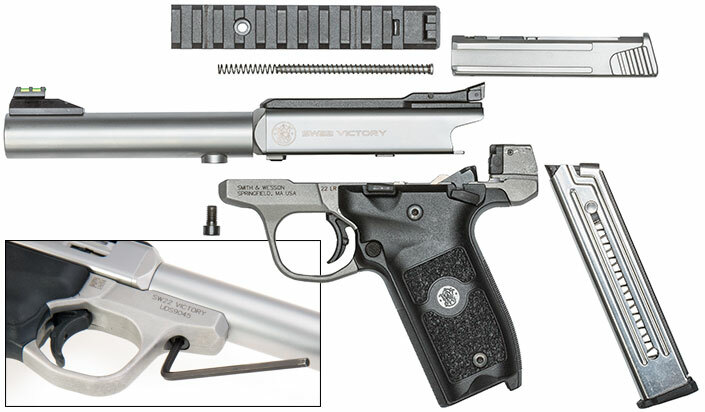 You do get a lot of goodies with the SW Victory: an included rail if you wish to mount optics, an extra set of grip panels for left hand shooters, and the street price is very appealing in the $350 -$375 range, a significant $100 or so less than the SS Ruger. The SW features one-screw take-down, the bane of the older Rugers, and the barrel is easily changed or replaced with a screw as well. It is a solid, hefty .22 pistol that feels great in the hands and weighs about the same in stainless as my Mark II does in carbon steel. From what I can discern, this Target model offers a better trigger and a polished feed ramp over the standard, similarly specified Victory. In terms of MSRP, only $20 separates the two models. How much of a difference in triggers there may, or may not be I cannot say. I can tell you that this S&W SW22 Target has an outstanding trigger. The trigger on my Ruger MKII bull barrel breaks at 4 lbs. 6 oz., while with the same calibrated electronic trigger gauge, the SW22 is noticeably lighter at 3 lbs., 11 oz., with significantly less take-up. The SW22 Victory was originally released in 2015 and has already gained quite a following, with new models being released regularly. There are also (at least) four Performance Center models available. The easy take down and field stripping is pathetically easy, as demonstrated here by Julie Golob: https://youtu.be/bZiSQNbeWK4 . It is one screw to take apart the pistol and one screw to quickly change barrels, if you wish. This is the type of convenient, practical, well thought-out design that is rare, and hard not to appreciate. There are already a large number of aftermarket grips, barrels, holsters, and so forth for for the SW22, but out of the box it is remarkably good with nothing needed as far as I'm concerned. The SW22 Victory Target Model is functionally perfect, with effortless take-down, and excellent heft and balance. It is the first .22 autoloader that is sending my Ruger Mark II into retirement and is the best pistol in its class on the market today. Congratulations to Smith & Wesson on the SW22 Victory, for it is just that.